I’ve been a bit distracted on this one and appear to be writing about a collection that’s been out for some time. My excuse though, is that I’ve been so carried away actually using it that I forgot to let all you lovely people in on the goss. This Autumn Estee Lauder launch their ‘Modern Mercury’ collection which is full of delicious, golden shades and strong berry lips. The image below sums up how striking this look is, although my personal preference is to keep the strong lips on the down-low and save them for a special occasion. The hero of the range for me is this beautiful illuminating powder gel. 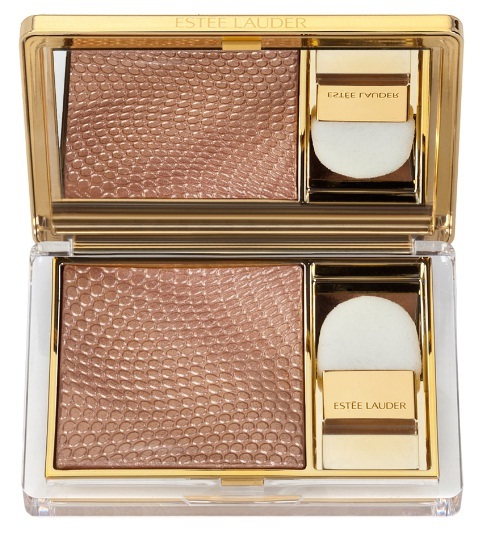 The texture is really strange – changing from a light-as-air gel into a blendable powder upon touch. The colour is light and golden, perfect for adding a subtle glow and highlighting cheekbones without being too obvious… the perfect ‘mid-season’ product for when you’re over the bronzer, but can’t quite face going back to the blush. Estee Lauder are also launching a range of new eyeshadow palettes which make it easy to create a smokey eye in various different hues. These have become a staple in my makeup wardrobe because the colours are so wearable and complimentary, as well as their easy blendability. The natural and golden tones to the shades suit any skin tone and can take you from day to night, just by applying a bit more of the darker shade around the waterline of your eye. The brush is actually useful too – one end is a thick bristle brush that is super soft and holds the lighter shade well to buff over the eye; the traditional foam applicator works well to define and draw on the darker shade and create more depth to the look. The colours haven’t come out very well in these shots (new camera, bear with me) but they really are gawjus. Check them out in store and online now – they’ll take you right through until next Spring.